These two buffers are very similar. 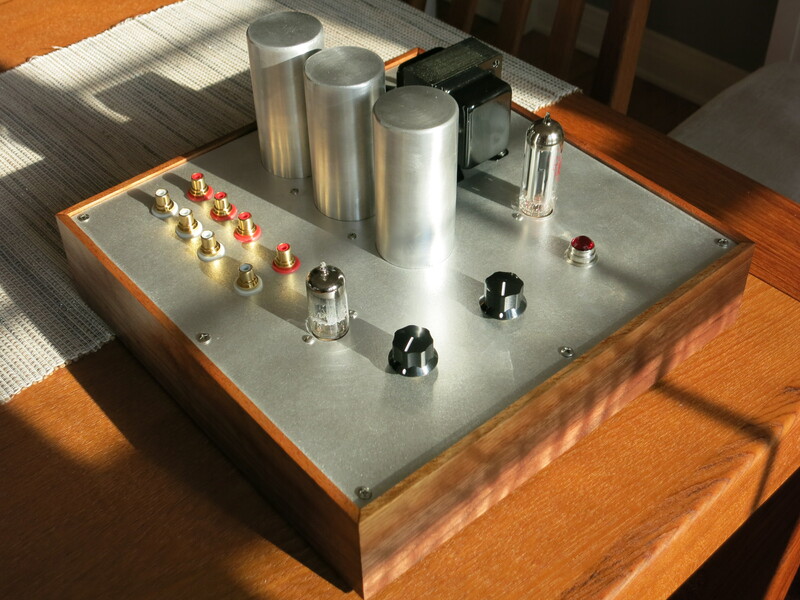 In fact, the XL came about as a simple mutation of the regular version when the cost/size of an extra tube was not an issue and there was the possibility of driving a lower impedance load (long cables, solid state amps, etc). In theory, the power supply requirements are identical down to the B+ current draw. “In theory.” Although if you study the schematics carefully and read the write ups, you’ll see that my steel-trap mind is missing a spring or two. The original Muchedumbre called for a Triad C-3X (500 ohm DCR). On the schematic for the XL, I seem to have spec’d the Traid C-7X (270 ohm DCR). The inductance rating for these two chokes is identical, but the C-7X has about half the DCR. Is that going to be a problem? In short: no. 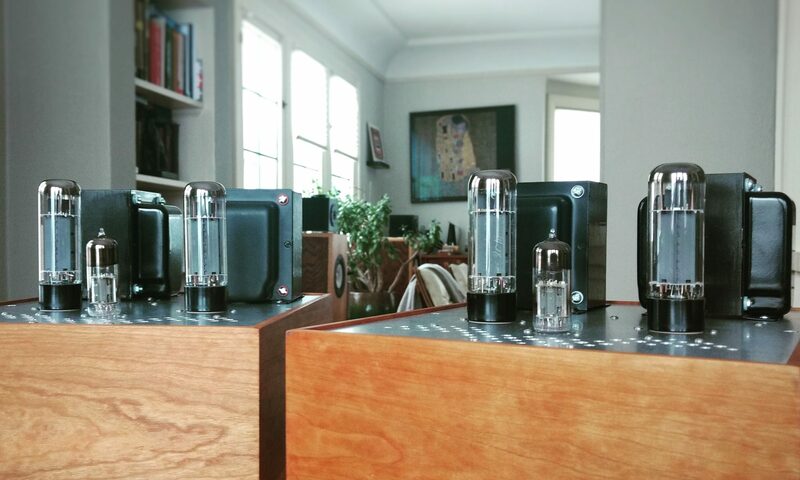 I love tubes; they make up for all my shortcomings. Current draw between the two configurations (XL vs vanilla) is the same on paper, despite the extra triodes in the XL (the added triodes are in series, so the same current flows through both). If using the same choke, the B+ should end up the same. With the modest current in the pre, however, you have plenty of leeway in DCR before you have to worry about big B+ changes. Net result is a 6.25V deviation from the ‘on paper’ spec’d parts. That’s less than 5% of the B+, so better than parts tolerance in a lot of cases (e.g. low frequency chokes). The x-axis divisions on most tube datasheets are 20-25V, so they’re only so precise. Generally, 10% changes in B+ based on available part specs is probably about where I would return to my load lines to recalculate. In practice, I sometimes build anyways and then measure actual B+ before worrying about anything. Solder and wire beats paper and pen. 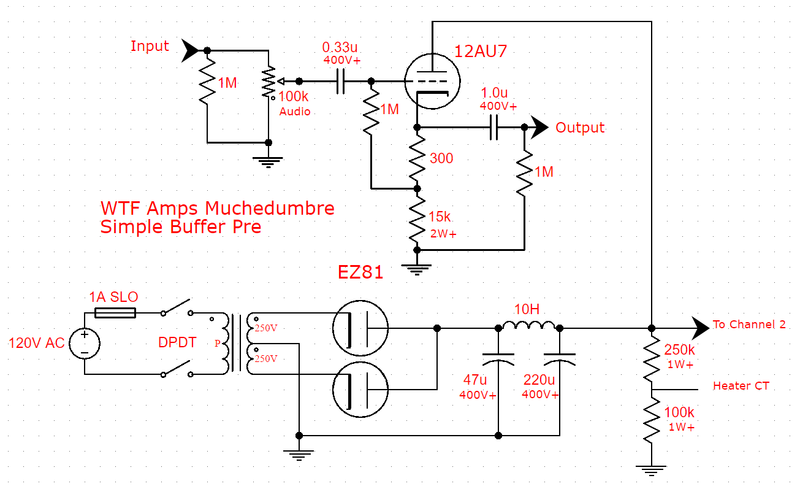 The regular Muchedumbre is an ultra-simple buffer with few parts and straightforward operation. It’s a great beginners circuit for high voltage tube applications. If you’d like something with just a little more nerd sprinkled on top (and an extra 12AU7), try the following. This XL version uses a White Cathode Follower buffer for about half the output impedance of the vanilla version. It requires a few extra resistors and caps and the heater reference voltage is tweaked just slightly so I can sleep better. Plugging in values for a 12AU7 and a (worst case) 10k input impedance gives you about 1k5 (rounded so that it’s an easy to find value). 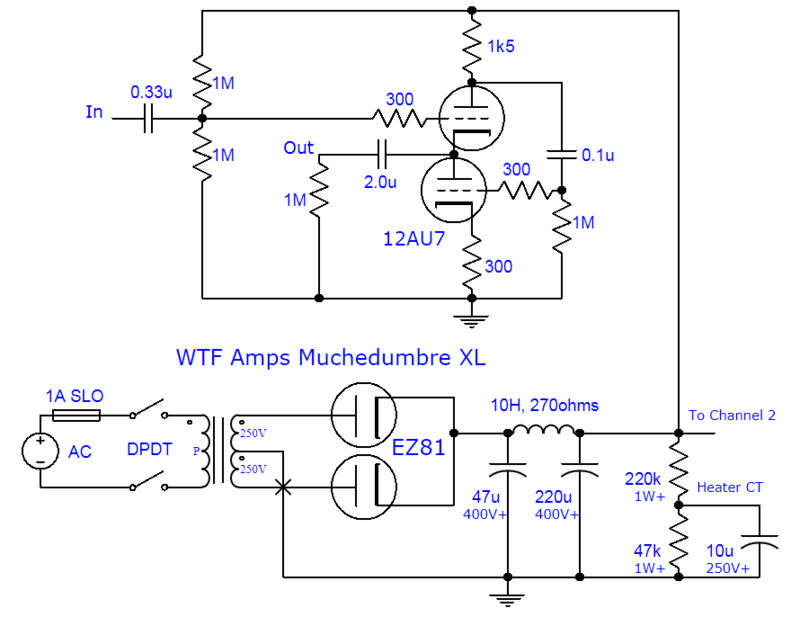 You can optimize this for the input impedance on your amp using a plate resistance number of about 7k and Mu of 20. Just keep in mind that the resistor is in series with the tubes and so it drops B+ voltage based on the current at the bias point. I am assuming a low input impedance on the amp and so the calculated value is also on the low side, but this preserves operating voltage and overhead. The actual drive current required in a typical preamp output stage is very small, so even a loosely optimized WCF is plenty capable. When in doubt, use smaller values for the series resistor for line level. If we were trying to drive something needing lots of current swing like a bunch of parallel output tubes or headphones, we’d be pickier about Rseries. If we break down the circuit into a cathode follower (upper triode) and a grounded cathode amplifier (lower triode), we can see that this creates a nifty push pull circuit. The cathode follower is non-inverting, so it’s pulling the output in the same direction as the input signal. 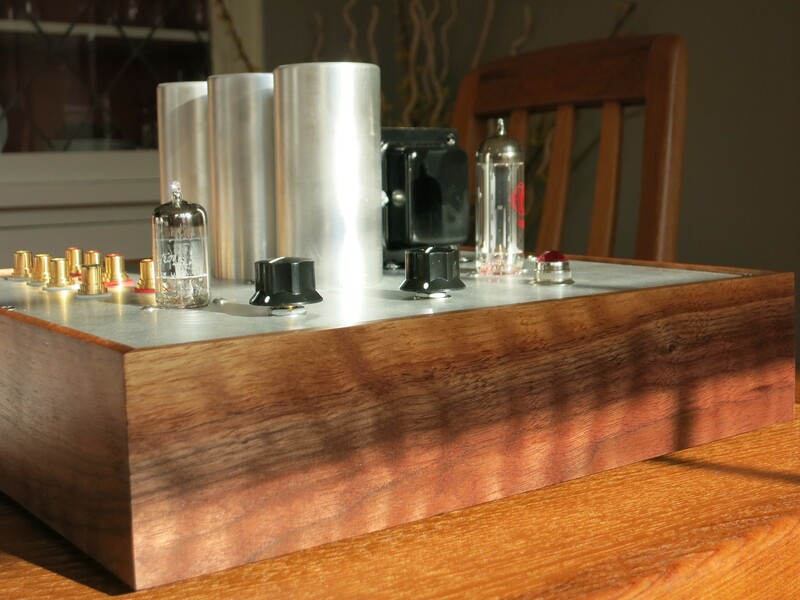 The lower triode is a grounded cathode amplifier and so it inverts the input that it sees. But the input that it sees is from the anode of the upper triode, which is already inverted. You invert the inverted and you get non-inverted (same ‘direction’ as the upper triode). Tada! Push (lower) pull (upper). This is a question that, as a beginner builder, confused me quite a bit. While it isn’t too hard to understand why a preamp cannot drive power-hungry low-impedance headphones, it’s less obvious what separates an amp that can drive headphones from a low gain line stage. 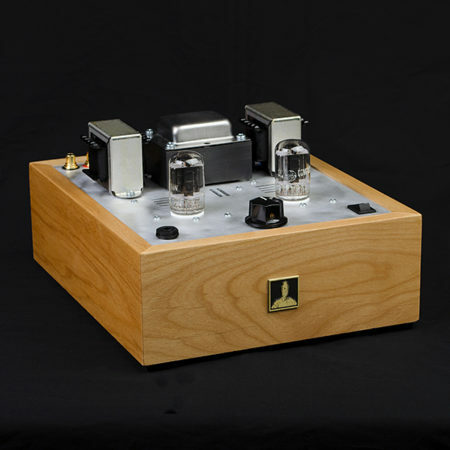 Headphone amps and preamps often share the same small signal tubes, usually Class A, and often single-ended. 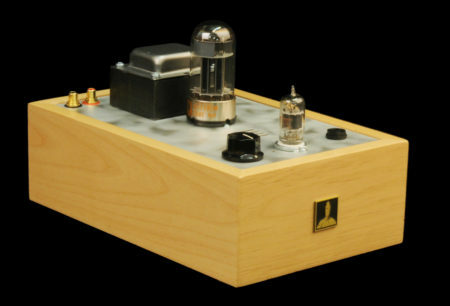 Here are the modifications I would make to the El Estudiante headphone amp to make it better suited to line stage duty. While a purposely designed line stage might perform better, I can’t think of a way to do a halfway decent tube line stage any cheaper or simpler. If you don’t go mad on caps, this costs less than the headphone version. Now we don’t really look at power output per se in line stages and we’re rounding up the peak output voltage as half the power rail voltage, but it’s obvious that we don’t need all the current to drive the input impedance of an amplifier because we’re limited by voltage anyways. Consequently, we can lower the current in the MOSFET output stage to something that doesn’t even require a heatsink, making a preamp build that much simpler and cheaper. With the LM317 CCS, we calculate the needed set resistor as 1.25V / Iq (where Iq is the idle current). A resistor of 100 ohms will give us 12.5mA idle current, which should be plenty for a reasonably low output impedance, but not enough to need a heatsink (I would probably still bolt my TO220 parts to the chassis though). In addition to lowering the idle current in the MOSFETs, we can change the big nasty electrolytic cap found in the headphone amplifier to a higher quality film cap. Electrolytics are great where you need a large capacitance in a small and affordable package, like the output coupling cap in a headphone amplifier, but electrolytic capacitors have been shown to create distortion at low frequencies (see Douglas Self’s Small Signal Audio Design) and exhibit leakage current that creates a thump on power down (which may just be annoying on headphones, but potentially damaging on a high power speaker amplifier). A film cap of this size at a rating of only 63V+ is not hard to come by. I’d probably buy an assortment just to see if I could hear a difference. We should also increase the size of the loading resistor on the output from the 1k in the headphone amplifier to something like 100k or 1M so that we aren’t rolling off the bass or unnecessarily loading down the MOSFET output stage. Finally, because we’re reducing the current in the output stage, our power supply requirement is relaxed, maybe opening up more wall-wart options to power the project. 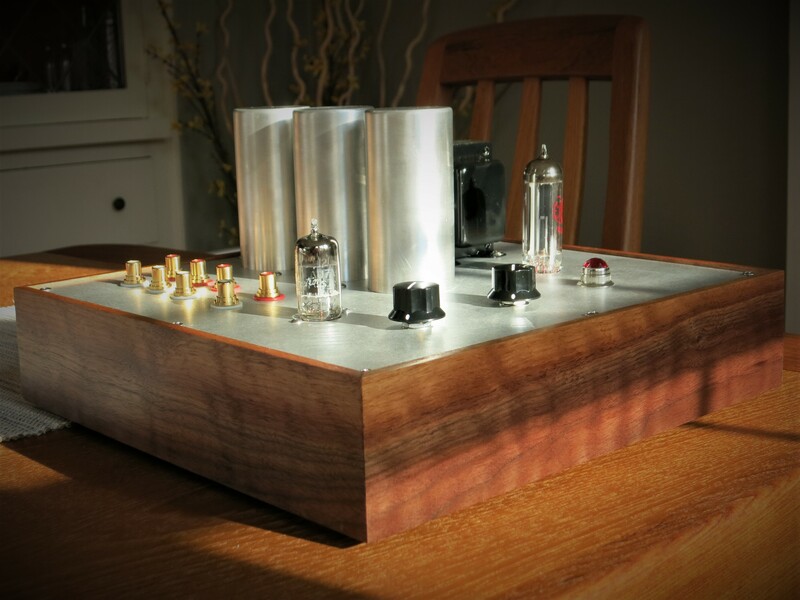 So if you’re looking for a simple, low-voltage, and cheap tube preamp option, modifying a headphone amplifier like the El Estudiante may be a good option. I’ve even used the headphone amp to feed power amplifiers in a pinch and it sounds surprisingly good. Letters to WTF: why doesn’t anyone include tone controls? Ideally you’d sandwich this kind of tone control between two cathode followers (or one low gain stage and one follower). I finished another Muchedumbre build with some slight variations. This has two outputs and two inputs (easily switchable back to the 1+3 arrangement). The power supply CLC filter uses all motor run caps instead of a mix of motor run and electrolytic. Other than these small tweaks, it is built as designed. The wood apron is a very nice piece of walnut with a lot of prominent grain motion and color variation and the panel is inset rather than sitting on separate interior spacer boards. This is going to live a very happy life in Madison, WI.